Out at Shul… and No Big Deal - reposted from Keshet. A series by Jewish moms and dads with LGBTQ children. When a child comes out, a coming out process begins for the entire family. In honor of Mother’s and Father’s Day, we bring you our third post in a series by parent leaders of Keshet’s Parent & Family Connection. The Connection is a confidential peer support program for parents and family members of lesbian, gay, bisexual, transgender, and queer Jews. We celebrate the support and love that these parents give their LGBTQ children – and the support they now offer other parents. This week’s post is by Ruth Loew, wife of a rabbi and mother of twin gay sons. You can read the previous posts in this series: one, by a mother of a queer daughter in Colorado, here, one by an Orthodox parent from Baltimore, MD, here, one by the mother of a gay son in the Philadelphia suburbs, here, and a celebration of Mother’s Day/Mothers’ Day here. A couple of decades ago, thesynagogue to which my family belongs hired a young rabbinic student, who happened to be gay, as its youth group adviser. In short order, its leadership then fired him, not because of any transgression, but merely because of who he was. The congregation’s membership turned out to be more liberal than its leaders. Shul members, appalled, rallied to the adviser’s support, and he was quickly rehired. At the time, this incident didn’t seem very relevant to me. My three sons were nowhere near youth group age yet, and I didn’t know many LGBTindividuals very well. I wholeheartedly supported the synagogue membership in its adamant opposition to discrimination on the basis of sexual orientation. Apart from that, though, I didn’t give homosexuality much thought, amid the ongoing pandemonium of parent-teacher conferences, carpools, swimming lessons, and squabbling siblings. 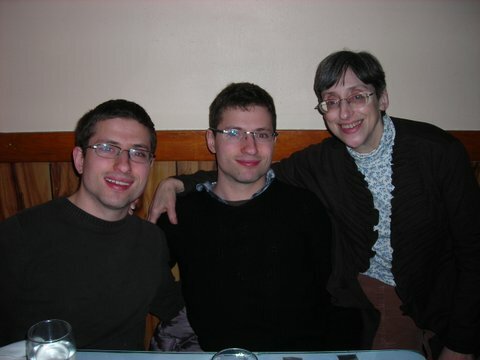 Then, during the adolescence of my two younger sons, identical twins, I started to wonder if one or both might be gay. They weren’t overt about it, but they certainly didn’t seem to be at all interested in girls. They were both fervently interested in justice for minorities in general, the minority that concerned them most seemed to be the LGBT community, and the worst criticism either could level at a politician was to call him homophobic. My husband’s response was generally: “They’re young, they’re shy, and they depend on each other socially; maybe they just haven’t figured out their sexuality yet.” Maybe so, I said; but if they look like ducks and quack like ducks, maybe they ARE ducks. By their senior year in high school, when they insisted on attending a seminar on gay marriage, even though it meant making their own travel arrangements and delaying our familyShabbat dinner, I was pretty sure. I didn’t want to talk to local friends about the matter, though, because I didn’t want to say anything that might embarrass the boys later. As I became more convinced that one or both boys were gay, I found it immensely reassuring to realize what a non-issue this was in my synagogue and how much support we, as a family, had there. By then I had come to know a number of LGBT individuals as friends, fellow synagogue and Jewish community members, and key contributors to that community. Once my sons were comfortable withbeing out in the Jewish community, I began to tell fellow congregants. As one gay friend said, “You can talk to me any time. It’s one thing to be liberal in the abstract, but it can feel different when it involves your own family.” I like to think that this synagogue environment made it easier for our sons to come out to us. Certainly it continues to support my husband and me in accepting and celebrating their sexual orientation as they have grown into responsible, compassionate, interesting young men. Jewish institutions need to be, not merely passively supportive of LGBT rights, but proactive in being welcoming and fully inclusive. We need everyone’s talents to build a community. We are enriched by the involvement of all. And where LGBT individuals are truly welcomed and valued, parenting a gay child becomes infinitely easier, too.